Tinea drurella Fabricius, 1775. Syst. ent. : 666. Leaf-miner: The larvae feed by mining the leaves forming a contorted gallery (UKMoths). A strongly contorted, often intestinine-like corridor, often forming a secondary blotch. Much green frass in broad arcs. Full grown larva mostly on top of the midrib. Pupation external (Bladmineerders van Europa). 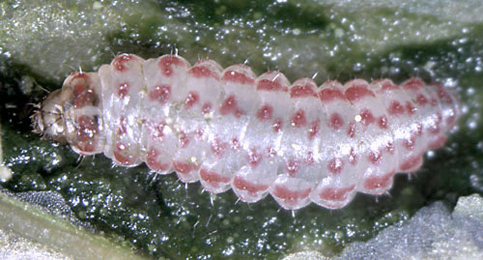 The red and white larva is illustrated in British leafminers, UKMoths and Bladmineerders van Europa. On the ground in detritus (British leafminers). Time of year - larvae: July - August, September (British leafminers). Time of year - adults: May and June, and again in August and September (UKMoths). Distribution in Great Britain and Ireland: Frequenting open ground and wasteland, and distributed widely throughout England (UKMoths) including Bedfordshire, Berkshire, Cambridgeshire, Denbighshire, East Norfolk, East Suffolk, Flintshire, Herefordshire, Hertfordshire, Huntingdonshire, Leicestershire, Middlesex, North Hampshire, Shropshire, Stafford, West Cornwall, West Norfolk and West Suffolk (NBN Atlas). Also recorded in the Channel Is. (Karsholt and van Nieukerken in Fauna Europaea). Rare in Scotland and not known in Ireland or Wales (UKMoths). Distribution elsewhere: Widespread in continental Europe including Albania, Austria, Belarus, Belgium, Bulgaria, Corsica, Czech Republic, Danish mainland, Estonia, Finland, French mainland, Germany, Greek mainland, Hungary, Italian mainland, Kaliningrad Region, Latvia, Lithuania, Luxembourg, Macedonia, Madeira, Norwegian mainland, Poland, Romania, Russia - Central, East, Northwest, South, Sicily, Slovakia, Spanish mainland, Sweden, Switzerland, The Netherlands and Ukraine (Karsholt and van Nieukerken in Fauna Europaea).